Not too long ago we published the story Today is National Game of Thrones Drinking Game Day (or It Could Be), which slammed the all too common practice of liquor companies making up “official” drinking holidays for the sole purpose of selling their products. The truth is, there are a number of legitimate and established drinking holidays, and Halloween is one of them. Halloween has long been considered a party holiday, a time when people come together to celebrate and often drink. With the craft cocktail revolution, Halloween is increasingly becoming a time for folks to bring out their jiggers and cocktail shakers and serve up interesting cocktails. Unlike Thanksgiving or Christmas where there’s the task of a heavy meal to attend to, Halloween is slightly less encumbered and a perfect time to roll out cocktails that are slightly more involved than your average spirit and a mixer or three ingredient drink. For this year’s Halloween celebration we’ve tapped some top bartenders and mixologists to bring you a handful of unique drinks, perfect for a Halloween celebration. 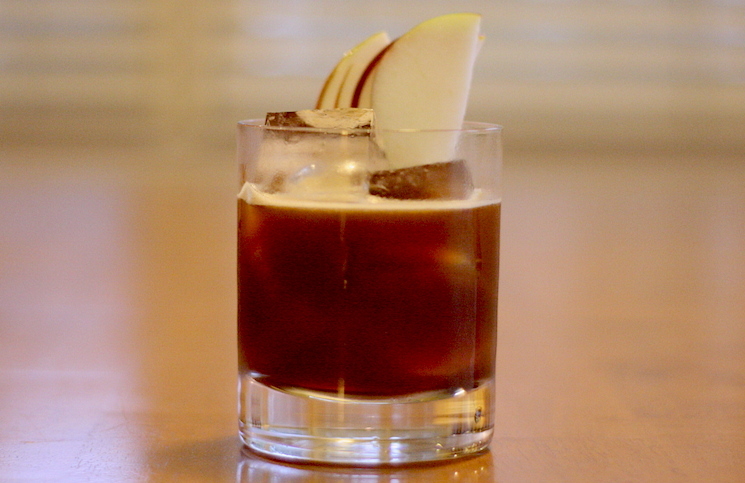 Our first Halloween cocktail recipe comes from Leo Robitschek, Bar Director at Eleven Madison Park & The NoMad. We’re huge fans of Leo’s work and have previously featured two of his drinks, All Betz Are Off (a.k.a. Gin Old Fashioned) and Verrazano Cocktail. For Halloween, Leo brings us a riff on the classic fall cocktail The Stone Fence [2 oz Bourbon, 4 oz apple cider, 1/2 lemon juice, 3 dashes of simple] using Rye whiskey and adding the unique Luxardo Amaro Abano to the mix. On its own the Amaro Abano is pretty bitter, but in this drink it imparts a beautiful woodsy floor for the lemon, cider, and rye to build on. As with almost every Leo Robitschek drink, the Mott and Mulberry is a flavorful, robust but balanced drink that is unique and delicious. Shaker and strain into a rocks glass with fresh ice. Garnish with an Apple Fan. Our next cocktail comes from author and mixologist Warren Bobrow. Like Leo, Warren is very much a drinks savant, well versed in the classics, but known for his inventive and delicious original cocktails. We fell in love with his first book, Apothecary Cocktails, and are happy to have a drink from his next book, Whiskey Cocktails. Warren’s Where’s the Dog Star? is a simple 3 ingredient drink that takes a little prep time but is well worth it. The combination of frozen hot chocolate, white whiskey, and Root Liqueur is divine, sweet enough to be a dessert cocktail, but balanced enough to drink any time. This is one of those “wow” drinks that, if you were to serve it at a Halloween party, would have everyone asking you for the recipe. Prepare the Hot Chocolate, and let it cool a little. Pour into an ice-cube tray, and freeze 8 hours or overnight. Pop the hot chocolate ice cubes into a blender and crush, or place them into a Lewis bag—a canvas bag especially made for crushing ice—and crush by hand by banging them with a wooden mallet. 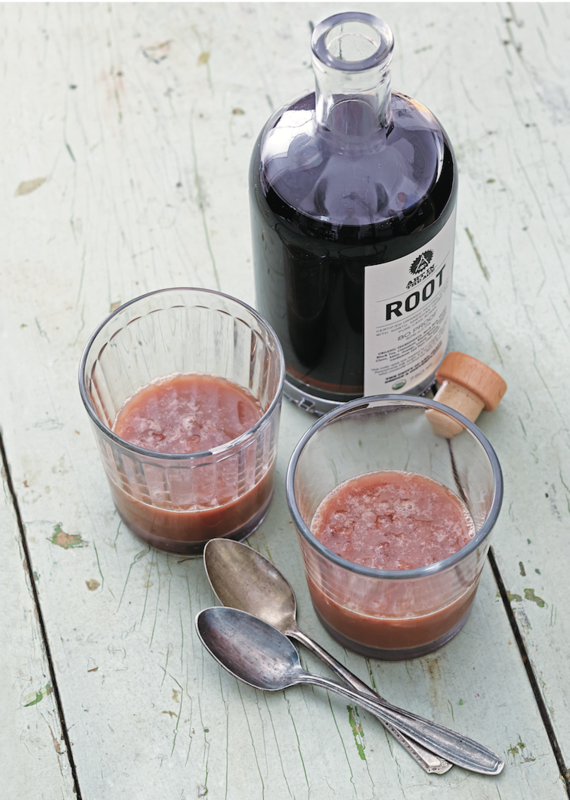 Spoon the crushed, frozen hot chocolate into a parfait glass, and then add the white whiskey and the root tea liqueur. Mix gently. Serve with both a straw and a long-handled spoon. Sometimes individual cocktails are too labor intensive for a bigger party, and to help solve that problem, Junior Ryan from Clyde Common in Portland, Oregon has a perfect solution: a fall themed punch that you can make in advance and serve to a good number of people all at once. Clyde Common has received a lot of accolades and awards, and it’s really Junior Ryan who is behind all that success. Junior’s Harvest Punch is smart and delicious, the kind of punch that you’ll wish you had made two batches of. Think of this punch a lot like a soup. Start with the spirits and work your way down. The sparkling water is there to dilute, so taste as you add to get it to your preference. This recipe is designed to be pre-chilled. You can serve it with ice and omit the sparkling water or you can put ice in a zip lock bag to keep it cold without further dilution. Be sure to let it sit for a number of hours before serving. Spoon the punch along with the apples into punch glasses and top with grated nutmeg. Instead of serving God awful candy vodka or sugarbomb ‘tini’s, these three cocktails help you elevate your game with delicious, balanced, and unique drinks that are perfect for celebrating this major fall holiday.